You see? You need a big engine to start the small ones. Putt-putt powered starter is for control line speed craft. Engine spinner is pushed against rubber tube on end of shaft. Carrier event control-line contender makes safe landing into arresting gear stretched across curved deck. 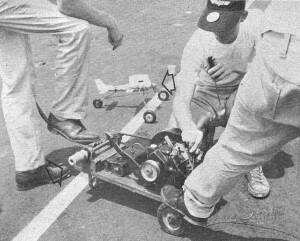 Sleek radio controlled "pylon racer" uses 4-channel receiver-transmitter, spans 66", weighs 4 pounds, has .19 cubic inch ·displacement engine for power. Such a model is the O.K. Cadet. The idea of a tethered or whip-powered model is not new, but the OK Cadet goes a step further and puts a real power paint in the nose of the model. This type of tethered model has. no movable control surfaces and is properly balanced to fly straight and level with engine running. 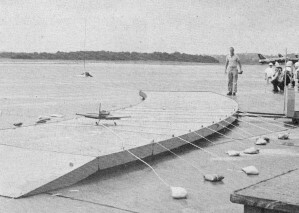 The single flying line (15' of monofilament nylon line) is tied to wingtip and fuselage at a point giving stable flying trim. By raising or lowering the control stick (held by flyer at center of circle) some up and down control is achieved. This control is necessary to counteract ballooning (climb) going upwind, and sinking going downwind and to help control take-off and landing. Another very good feature of the OK Cadet flying line stick set-up is that the line can swivel and turn freely on the stick end. This permits the flyer to stand still in the center of the flight circle and let the model fly around him. This is important to beginning flyers because spinning around in the center of the circle following the model can cause dizziness. With the OK Cadet control stick .the flyer can stop turning if he becomes dizzy, and simply hold the stick above his head until the dizziness passes. The model will keep on flying. 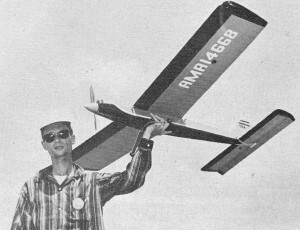 Somewhat more advanced than the tethered OK Cadet, other engine-powered plastic flying models utilize a standard control system and control handle set-up giving full elevator control of the model. The elevator action works the same on a model as on real aircraft. The control handle movement is transmitted to the model by two flying lines. These are connected to a bellcrank which in turn is linked to the elevators by a pushrod. Tilting the control handle top back gives up elevator causing the model to climb, tilting handle top forward gives down elevator causing dive. Most of the powered plastics use small "1/2 A" engines with .a displacement of about 0.049 cubic inch, and are flown on 15 to 25' light Dacron lines so a clear circle of 50' plus diameter is needed to avoid hitting obstructions. Areas such as school yards, public parks or parking lots having smooth surfaces are needed to fly these control line models. There are knock-apart powered plastic trainers ideal for the beginner whose limited flying skill is bound to be rough on the model. Other types are detailed scale copies of real aircraft both single and twin-engined. Parts are injection molded plastic shells similar to those used in non-flying plastic scales, but larger. Another innovation in the powered plastic field is the molded foam plastic type. Models such as the Sterling Mustang utilize this type of fabrication. The structure is very light in weight, has a smooth finish, is impervious to glow fuels and has excellent shock absorbing qualities. The latter being most important to the beginner. Most powered plastics offer performance limited to take-off, landing, and round and round flying. The Sterling Mustang is capable of limited stunt flying. All of the powered plastic models are ready-to-fly in the true sense of the word. The products include propellers, flying lines and handles. Some come complete with fuel, plug wrench and battery wires. A little simple knot tying, filling fuel tank and engine starting are all that is needed to get them airborne. Dry cells for starting glow plug engines are usually the only additional purchase involved. 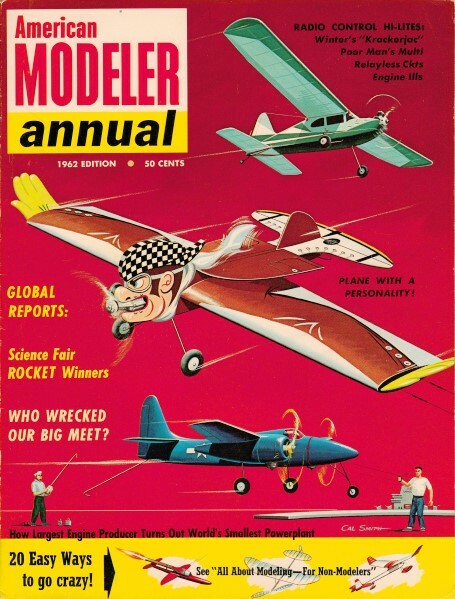 OUTDOOR - After cutting his teeth on plastic scales, chuck gliders and an engine powered plastic trainer, the young modeler can progress to building his own. This is the turning point for most. He will either lose interest after some moderate success with ready-to-fly models or continue into building models from kits, later on from magazine plans, and perhaps from his own designs. If he chooses to go ahead the modeler will find a wonderful world of engines, balsa, cement, tissue, dope and high-flying model performance. He will become (painlessly) a student of physics and aerodynamic theory, a skilled craftsman and mechanic, in short a REAL modeler.